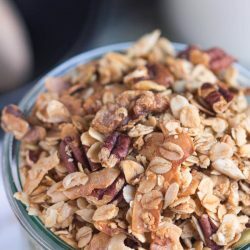 Mix up your own granola with my simple homemade crunchy granola recipe. Easily customised to add in your favourite ingredients, and very easy to make, you need never buy another box of sub-standard granola again. Preheat the oven to 160C (140C fan forced), and position the oven racks in the middle of the oven. Line two large baking trays with baking paper, and set aside. Measure the rolled oats, walnuts, pecans, sunflower seeds, pepitas, and coconut into a large bowl. Place the coconut oil into a small saucepan over a low flame, and allow the oil to melt. Whisk the maple syrup into the melted coconut oil to combine. The mixture will seem to thicken and emulsify. Pour the coconut oil mixture over the dry ingredients, and stir until the muesli seems slightly damp. Divide the mixture between the two baking trays, and spread the mixture evenly over the trays. Bake for about 30 minutes, stirring the edges of the mixture into the middle every 5 -10 minutes to ensure even baking. Watch the muesli carefully towards the end of the baking time and check more frequently as it can burn easily. When golden brown, remove the granola from the oven and allow to cool. Store the granola in an airtight container. Change the nuts and seeds in the recipe to suit your own tastes. If you are catering for nut allergies, replace the nuts with the same quantity of seeds. I have used a minimal amount of sweetener in this recipe. If you like a sweeter granola, just increase the amount of maple syrup by 1/4 cup. If using olive oil instead of coconut oil, reduce the amount used to 1/3 cup. Scatter 1 cup of dried fruit over the granola when it comes out of the oven if desired. This crunchy granola recipe will keep for up to one month in an airtight container. The nutritional analysis for this recipe is based on a one cup serving, with no additional accompaniments. The addition of fruit, yoghurt and/or milk will change the nutritional profile of the recipe.